The 3rd Annual C.H.A.M.P. 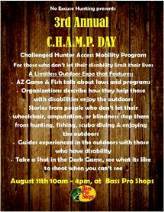 Day at Bass Pro Shops in Mesa will be held Saturday, Aug. 11, 10 a.m. to 4 p.m. The event will cover outdoor activities such as hunting, fishing, camping, and scuba diving for people with and without physical limitations. While this event is designed with helping those with a physical limitation find ways to enjoy an activity many may think not possible, it is open to everyone. Speakers from Arizona Game and Fish who will talk about Arizona’s programs that help those with disabilities hunt, fish, and enjoy the outdoors. Organizations dedicated to assisting those with disabilities to enjoy the outdoors. Speakers with various limitations who will talk about overcoming their disability in order to enjoy the outdoors. Local guides and outfitters who will talk about what they have to offer. Representatives from leading manufacturers will be available to discuss their products and some creative uses. The Bass Pro Shops Mesa store is located at 1133 N. Dobson Road.